Julius Bittner was born in Vienna in 1874, growed up just outside of his hometown, and died in that same town in January 1939. He was pretty much immediately forgotten after his death. Well, in 1939, Austria, Europe, and the world at large did have some other things on their minds, as World War II began that September. But it's remarkable that someone who was so plugged into the classical music world, who was actually one of the most performed of the Vienna composers for the theater during his life, would so quickly be forgotten. Part of the reason may be that Julius Bittner divided his time for a good part of that life between music and his first career, Law. Bittner's father was a judge, and his son followed in his footsteps. Lucky for Arnold Schoenberg, because Bittner was able to make some calls (based on medical reasons) so he wouldn't be conscripted into active military duty when the First World War broke out in 1914. 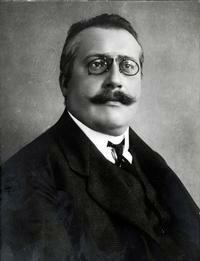 Before that, Julius Bittner was the official who settled the estate of Gustav Mahler, who had died in 1911. Bittner edited a music journal, he wrote music criticism, and all the while composed music, some of it even prize-winning. Mahler had helped him along. So did the conductor Bruno Walter, who premiered Bittner's quite successful opera Der Musikant, or, The Musician, in 1910. He wrote many operas and operettas, many of which did quite well. He wrote songs for his wife Emilie Weiner, a contralto. With Korngold, he arranged the music of Johann Strauss, Jr. into an orchestral potpourri that was for a time very popular. The symphony we hear on Discoveries this month is one of two that Julius Bittner composed. It's from 1922. He was 48 years old, and it's from when he was still working for the Austrian Department of Justice. Felix Weingartner conducted the Vienna Philharmonic in the premiere in 1923, and its success certainly went a long way toward encouraging Bittner to give up his day job and focus on composing. The Symphony is in F minor, and is in four movements: Fast, Very Slow, the third movement Very Quickly (one beat to a bar), and the final movement, again, Very Quickly. Solidly in the Wagnerian side of the Romantic tradition, meaning, Bittner was a man of his time and doesn't break any new ground here. He does have a lightness, though, that is appealing, and at times even a lightheartedness-which perhaps makes sense for an operetta composer. The Fleisher Collection was central to this recording seeing the light of day with the Siberian Symphony Orchestra conducted by Dmitry Vasiliev. The great Viennese publisher Universal has this Bittner work in their catalog, but as often happens, the materials were so old they were literally falling apart. Actually, Universal described the materials in their archives as "rotted." But as it happens, this Symphony is one of the hundreds of works Edwin Fleisher himself collected on a European trip way back when, that has been kept safe and in good condition since its publication in the 1920s. Because the rights belonged to the publisher, Fleisher never lent out the work, of course. So Fleisher's curator, Dr. Gary Galván, offered to digitize and reproduce the clean Fleisher materials so the recording could be made. Universal happily agreed, and here we are with this Toccata Classics recording of the Julius Bittner First Symphony. This kind of thing has happened a great number of times over the years and is just one of the many behind-the-scenes services to the world of orchestral music provided by the Fleisher Collection.